During the Marvel UK run of the Transformers comics in the 1980s, readers were treated to an original character created by Simon Furman. In the classic story “Wanted: Galvatron – Dead or Alive!” Death’s Head was introduced as a freelance peacekeeping agent (definitely not a bounty hunter – as Scourge found out the hard way) aiming to collect on a bounty placed on the head of Galvatron by Rodimus Prime. From this early appearance Death’s Head would go on to make a handful of appearances in the Marvel UK Transformers stories and then was brought across into the main Marvel universe. Now, after a couple of attempted revivals, Death’s Head is set to return again. Marvel Comics today announced at C2E2 that an all-new Death’s Head series will bring the character back to the Marvel universe, where he’ll cross paths with Young Avengers characters Wiccan and Hulkling. Best of all – this Death’s Head seems to hew much closer to the original character, complete with his original vocal tic coming through. Although as a character, Death’s Head has long since parted ways with Transformers, he’s still very much a part of the family – and this new series will see some Transformers comics alumni working on reviving Death’s Head. Long time Transformers artist and writer Nick Roche will be providing some of the covers for the series – and the lineart is set to be provided by Kei Zama, fresh off her run on IDW’s Optimus Prime. 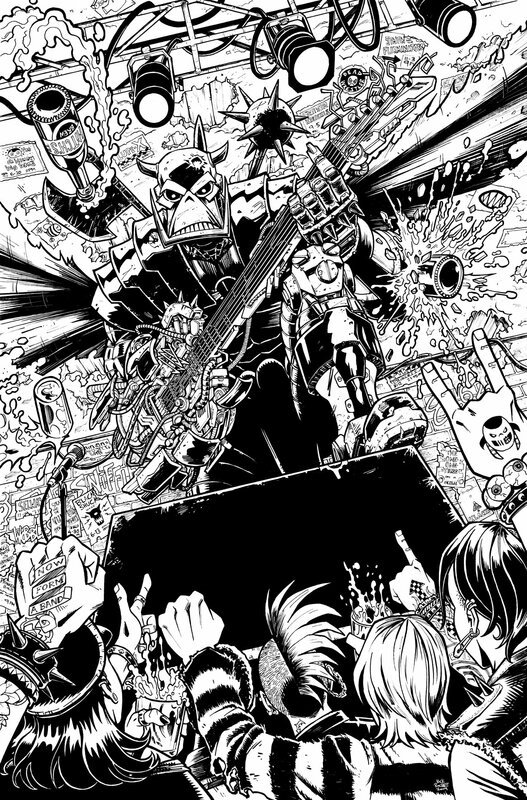 Kei’s 2000AD inspired artwork seems like an extremely good fit for Death’s Head and we’re certain she’ll do the character proud. Rounding out the creative team is Tini Howard who will be the writer on this new series. Buzz from the team working on the series is very positive – and according to Kei Zama, Death’s Head will return in July. Thanks go to @XavierFiles on Twitter who was the source for this story. 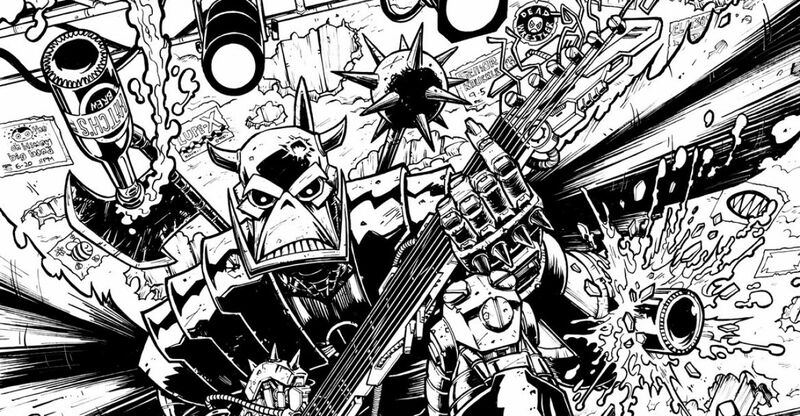 Be sure to also check out this tweet from Nick Roche showing his lineart to the issue #1 cover – check out the sly reference to the less well-remembered Death’s Head II on the hands of one of the guys in the crowd! Now, who do we have to petition for a Freelance Peacekeeping Agent vs. Merc with the Mouth showdown? Here's the Amazon pre-order listing if anyone wants to pre-order. I have no idea why they keep using that FF MMW stock photo…. Of course it would start with them fighting before teaming up. 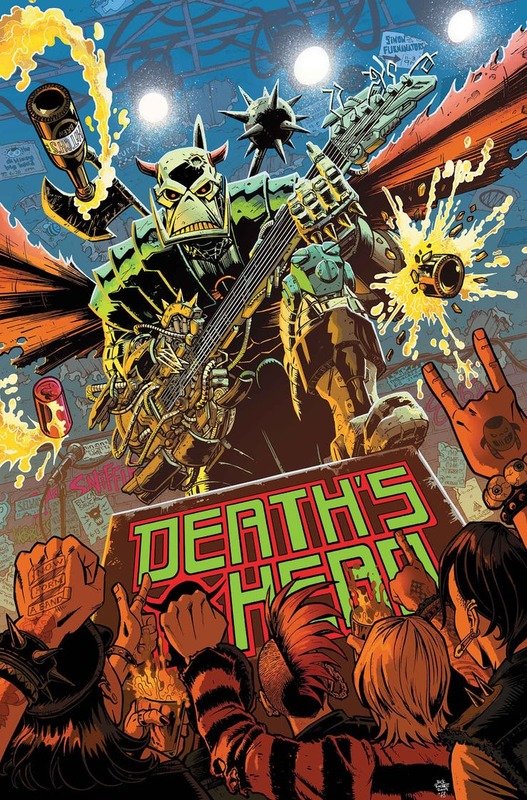 Death’s Head, in a new miniseries! When a job goes wrong, intergalactic mech merc Death’s Head wakes up half-assembled at a punk show! And if the crowd full of deodorant-eschewing youths wasn’t enough, the Young Avengers show up! Well, half of them anyway. Hulkling and Wiccan face down the best freelance peacekeeping agent in this universe! Well the art looks okay, but the interview just makes me worried, yes? I was worried before because of her current work on one of the Conan spin-offs. The first issue was beyond terrible. This interview makes me further question Marvel hiring practices. I might just check out the storytime on /co/ before plopping down my cash for this. They've saved me countless burgerbucks on rubbish titles that initially looked good. With 500+ funnybooks coming out every month, there's always something worth spending money on. I feel the same way about you. But the difference between me and you is that I dont call people insulting names over their opinions of fictional characters. Have fun with your Death's head. Deaths head is a turd stain on the TF franchise. He belongs in an x-men comic or something. Didnt know he was a robot. I just dont like how he was drawn in typical super villan fashion. For me personally, the thing that made Transformers so cool in thev80s is that they truly were there own thing. They werent superheroes or army men. But like I said earlier, I was never a comic guy to begin with. I grew up on the G1 cartoon which generally kept the spotlight on the Transformers, not other beings around them. DH was a non-transformer alien robot that was a bounty hunter. He'd be comparable to the Lithone robots from the movie, rather than a super hero. Man this is getting added to the pull list. Those McCrea pieces are absolutely stunning too! Yeah the interview makes me worried also. obviously it's all in the execution and I'll remain cautiously optimistic, however this isn't a mindset I'd expect DH to get into. I don't like DHII at all, however I'll just say for those that do, he was very popular and had a lot of fans out there. Still for me, DH is far superior. I am surprised he has fans. I mean he is so… generic. I have read so many comics exactly like that, with forgettable badass characters. Nothing really stands out to make him different from those 90ies extreeeeeme badass anti-heroes. Not to sound dismissive of the project because I understand they've grown from then and as always every character has their fans… They are from the Young Avengers where the project came about when marvel was on their kick of bringing in big time authors and screen writers to do short series. It contained a bunch of new characters that were basically iterations of classic Avengers but with added spin and diversity. They've basically been crossover event characters since then. I didn't know, haven't read Marvel in quite some time. So they are the same characters but young? Or clones? I once read a Marvel comic where some time mishap brought back young Jean Grey and Cyclops to the current time and they just joined the x-men again… man that was dumb. I think people mainly want him in the marvel legends 6" scale. Oh, well, that could happen someday. Given how a lot of even less known characters got toys in that one. Ahem, favourite Death's Head continuity, yes? Or are you recommending the Marvel UK TF comics only? Because the Death's Head series is great. I was recommending the comics to the guy I was replying to, as it was clear he did not know about the comics and he said so himself. Death's Head being in them is just an added bonus, yes? They debuted in Young Avengers, a comic about a bunch of powered teenagers trying to fill the void left by the Avengers in Avengers Dissasembled. They are named Bill and Ted and they have excellent adventures. Wiccan is Billy Kaplan. Mutant magic gay jewish kid (no, not Wicca) with reality warping powers. He and his brother Tommy are the reincarnated souls of the kids of Scarlet Witch and Vision. He's the character most commonly shown in future stories to be the next Sorcerer Supreme. He's also retroactively the source of all magic of the Multiverse or something like that. Hulkling is Teddy Altman. He's Billy's boyfriend. He's the son of honorary Avengers member Captain Marvel (the late Mar-Vell), and a Skrull princess. Somewhere in space there is a bunch of hybrid kids like him who consider him the chosen one of something. He could probably claim the throne of the Skrull empire if he wanted, and if the Skrulls didn't hate the Kree so much. A version of him of one possible future is both an avenger and king of space. They wouldn't really be the kind of characters I would team up with Death's Head in a story, but let's see what comes out of it. Well that bolded part is in a nutshell why I don't read comics nowadays. How convoluted and dumb is that origin??? Also why is he calling himself Wiccan if, y'know, he isn't a wiccan? That'd be like Dr Strange using the name "Superpope". Then you’ve never read a Transformers comic with Death’s Head in. Now if you said Death’s Head II or III, I’d agree. The only good Death’s Head is the original. Was the third version ever used even after his lackluster comic? 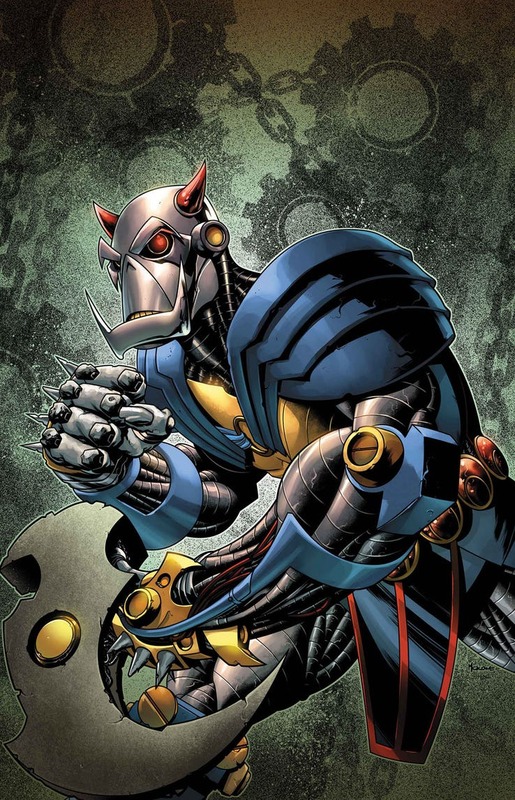 I know Death's Head that was closer to the original first version later appeared with Tony Stark and Beast in that SWORD comic, but I am guessing the new comic will be rebooting that one too. Im more of a cartoon guy, but I do have some expierence with OG Marvel Transformers comics. They were plagued with superhero style characters like robot master, circut breaker, and the mechanic. Marvel couldnt just let Transformers be Transformers. They had to insert men in tights and masks with special powers into the stories. They couldnt keep it about the robots. Im definitely not a fan of that, lol. Sounds to me you only have experience with the Marvel US comics. All the human stuff was added because Budiansky always felt the comic should have a human element because the readers could not identify with the Transformers… yeah, dunno why. The UK comics (which are in the same continuity) were far less reliant on humans, even if they do play some roles. I recommend checking them out. Wican and Hulkling? Yeah I’m not reading that comic. Circuit Breaker is no super hero, she's a genius who used her expertise to build a suit to take revenge against the Transformers. Robot Master had no powers whatsoever, he was an actor hired by the US government to give a face to the robot menace, he was then taken by the Decepticons to serve their agenda. The mechanic was just a regular mechanic who stole Cybertronian technology to use for criminal activities. None of them were superheroes or supervillains and none of the human characters stole the comic, there was only one group of superhumans in the entire run whose story took a backseat due to them being a fish out of water in the TF battles. The aliens and robots that appeared were no different to anything the show threw out. That doesn’t describe the cartoon at all. They were all about the Transformers interacting with humans, aliens, monsters and other weird creatures. Dr. Archeville was the first main human super villain in the cartoon but he wasn’t the last. Nightbird was a giant robot created by a human scientist, Lord Chumleigh was just a human hunter who proved to be a threat, then later in season three, humans turned four Autobots into synthetic humans, the Quintessons also played a large role in season three, and humans were responsible for the hate plague, then the Transformers went to Nebulos in season four and interacted with a large number of green alien humanoids. Don’t know where you’re getting the idea that the original cartoon was only about the Transformers interacting with each other and nobody else. Season 3 was definitely a change in the game. But cmon man, they never had the goofy stereotypical marvel or DC type heroes in the G1 cartoon. Dr. Arkiville was not a super villan. He had no powers. He was a scientist. And Nightbird might have not had an alt mode, but she did somewhat resemble the aesthetic of a Transformer without the alt mode kibble. And the Quints were unique type aliens. They were not some wanna be Dr. Doom type of character. And for the most part they interacted with the Transformers. The show didnt put any organic life forms in a super human capaticy. It was all about the robots. The humans never really stole the show. Maybe Spikeor Daniel did once in a while. But they didnt dress them in stupid costumes or give them stupid powers. The closest thing might have been in the "only human" episode. But it was science that shrunk them. Well, it was Marvel after all. Spider-Man also made an appearance in the third US issue. Then we had GB Blackrock start off his new superhero team. Plus there was R.A.A.T. and the Roadjammers. Death’s Head was a giant alien robot himself though; not a human in tights and masks. Still don’t know what you have against a giant alien robot appearing in a comic about giant alien robots. He’s basically the equivalent of cartoon Devcon in that neither had a toy and was inserted into the series to fulfill a particular role. I would like Death’s Head to return to Transformers… with a new name and appearance but keeping the exact same personality, motivations and abilities. Just assign all that to the eHobby repaint of G1 Hound Detritus who has kind of a similar background to Death’s Head but has largely gone unexplored by anyone. I also have absolutely no idea who Hulkling and Wiccan are… I assume because they are like, D-stringer heroes only slightly above the likes of the Great Lakes Avengers? It's pretty clear from what she is saying that she doesn't really understand what Death's Head's charm was – his amoral, business-like attitude and complete indifference to larger events happening in whatever continuity he was in, be it Transformers, Marvel, Dr Who, Dragon Claws unless they got between him and his profit. The whole obsoleteness and aging angle are not something I'd ever associate with a giant robot who can already easily replace parts of himself and does so regularly. If he ever finds a weapon obsolete, he would just get a new arm attachment, yes? As for other versions, please, nobody wants to see Death's Head II, okay? That thing was one of the gazillion "extreeemeee" pointy overmuscled edgy anti-heroes running around at that time, with Cable and Stryfe and the myriads of clones of them Liefeld created for Wildstorm or Image (or both?) after he left Marvel. I for one consider the "What if…" story canon where Death's Head v1.0 killed that ugly thing. But, Hasbro already made a Death's Head figure. I own it too, one of the few Marvel toys I have! Sure he is pretty small, but he is in scale with Legends sized toys. I cannot recommend the Marvel UK comics enough. To this day, it is my favorite TF continuity.